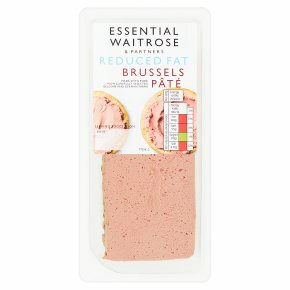 A smooth and creamy pork liver pâté that contains 30% less fat than standard Waitrose Brussels pâté. Waitrose have selected assured farms in Belgium demonstrating exemplary standards of animal welfare and traceability. Waitrose work closely with our suppliers to ensure selected farms meet our specified pork standards for animal health, welfare and traceability. Contains 30% less fat than standard Waitrose Brussels pâté.